Every time I think about getting a handle on the books that live in my house, I also think about my relationship with books and reading. 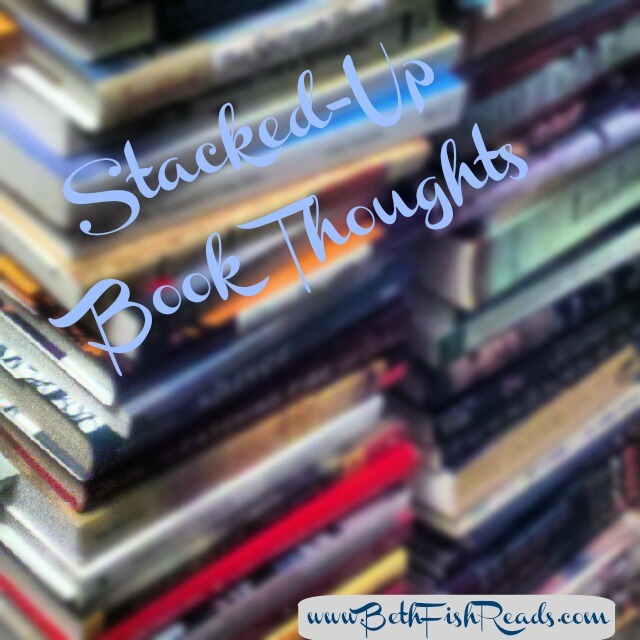 I find the thinking about books to be way easier than the culling, organizing, and prioritizing. In fact, I had planned on going through my bookshelves a few days ago because I need to get the stacks of books off the floor. Instead, I put on an audiobook and did something else. 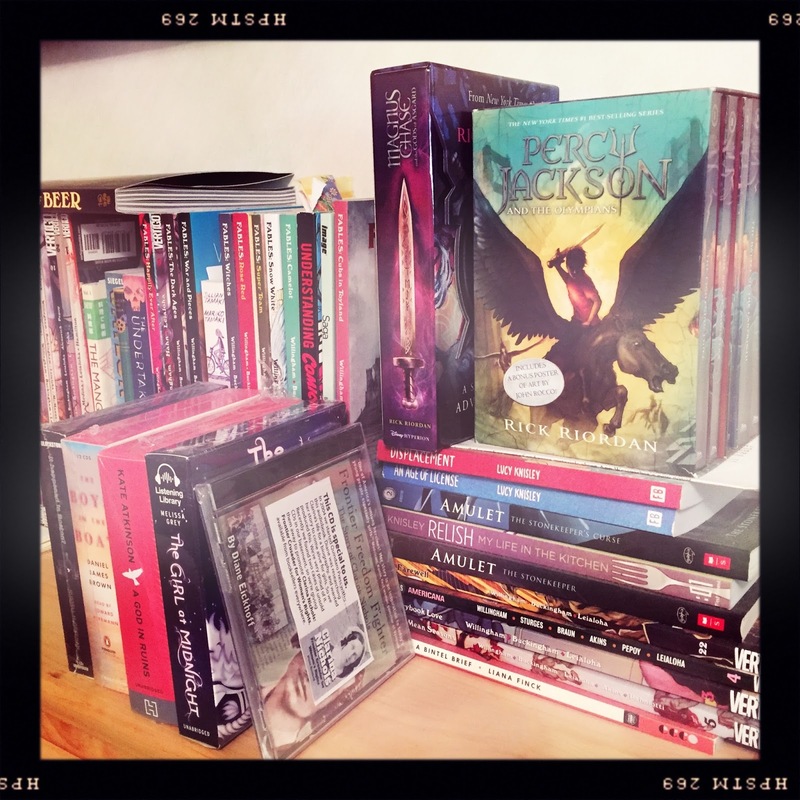 Right before I started that audiobook, I had the following random bookish thoughts. 1. I used to save every book I read, whether I liked the story or not. Over the years, I've become very selective about what I keep. 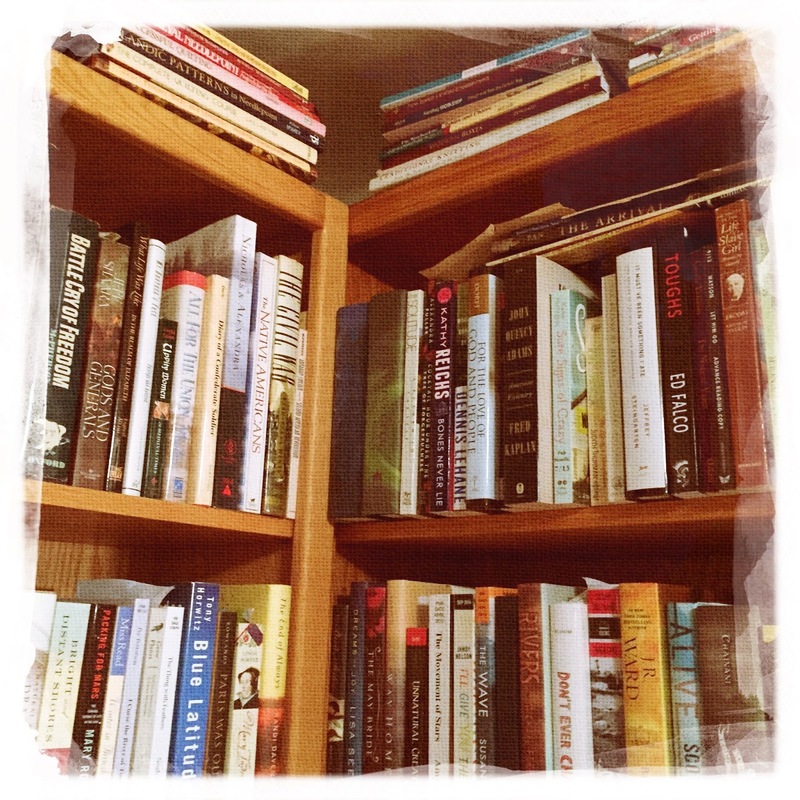 Granted, I still have piles of books all over the house plus overstuffed bookshelves. 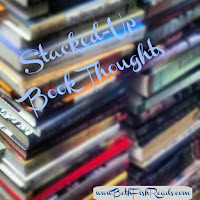 For some odd reason, though, I perceive myself as being ruthless about culling books. 2. I'm a polygamous reader. As a foundation, I always have a print book, an audiobook, and an eBook in my rotation. In addition, I likely have a science book, a fat book, and an "Oh look it's shiny and new" book in progress. More often than not I finish all the books I start, but I don't worry about it too much. 3. I used to finish every book I started, even if I didn't like it. Now I have no problem whatsoever abandoning books that don't call me. This is different from those books that somehow get pushed to the side for the new and shiny (see point 2). 4. I go through years-long stages of being yea or nay about writing in books. This summer, I've suddenly begun to write directly in my books again. It's kind of fun. 5. I used to never read a mystery series out of order. Now I'm not so picky and will read anything in the crime / thriller / mystery genre regardless of series installment. 6. That said, for almost every other genre, I'm a strict in-order reader. Curses to all those damn trilogies. 7. I love surprises. I've read books based on the title or cover or author alone. It's exciting to go into a book totally blind. What's more, I never read the author's note or the foreword until I've finished the book. I really don't understand people who read the end first (these people, I am told, actually exist). 8. My eyes/ears are always bigger than the time I actually have to read/listen. I buy books and accept review books with all the sincerest intentions in the world. Reality sinks in every day, but I still remain full of hope. 9. I was quick to adapt to electronic editing, but I've struggled with eReading. I can't figure out why. Still, I make sure an eBook is always in my rotation (see point 2). 10. I used to write thoughtful, insightful, long book reviews of every book I read. Now I post a few thoughts on Litsy and do quick reviews here. I'm hoping my mojo returns. 11. On the other hand, I have no trouble writing reviews for freelance assignments. Perhaps the deadlines or money is a motivator. 12. On the third hand, I find I love writing round-ups and spotlights and features. Which is great because . . . well, see point 8. 13. I have mixed feelings about book acquisition. 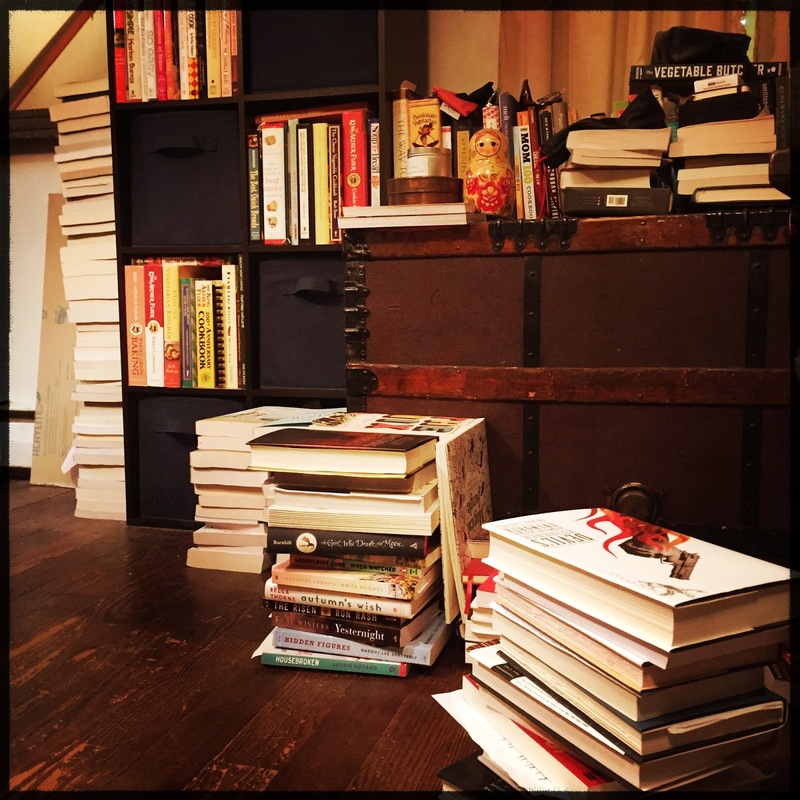 A day without new books makes me very sad, but a day with new books can be a little stressful--where to store them, when to read them, how to write about them. 14. I still buy books (see point 13). No matter how many review copies I get there will always be other books I just have to own. 15. I still use the library (see point 13). 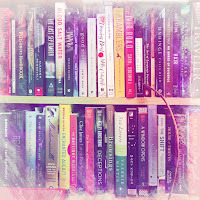 No matter how many books I own, there will always be books I want to read but don't want to save. 16. 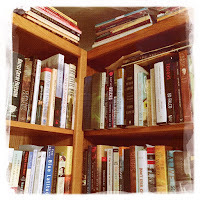 My books are basically not organized--not by genre, or series, or author, or color. Yet I can (almost) always find what I want when I want it. 17. Sometimes I question my sanity. I agree whole heartedly with most of your list.However, I got so inundated, I just resigned from a review site because it wasn't fun reading-reviewing- reading-....I have a great library system with a poor selection, especially the electronic books. Rather than "buying" one, I have passed the suggestions on. They buy, I borrow and everyone seems happy. By resigning, I'm letting myself enjoy reading again. Went to a free summer concert last night with a paper book and enjoyed both ( I recommend the Inn at Eagle Point by Sherryl Woods. It's been optioned by Hallmark and starts next week. If they are able to reflect half of the nuanced love story, this looks to be awesome) immensely. I've also taken a "facebook fast" so I don't feel pressured right now. 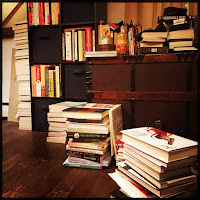 Days with new books ARE wonderful and I agree with the "where to store" them problem. It's a good problem to have though! Haha - I love this post! And, am on the same page with you for some of these...particularly #1 and #3. And I've also been finding myself unable to write long reviews this year. I think I've written less than 5 "formal" reviews. The rest have been mini reviews, reviews in quotes, and book lists. Which I'm actually finding more fun anyway. Boy, oh boy, I could have written most of those thoughts and could relate to almost every single one of them. I used to know every single book I have - someone would mention a book and I could tell them if I have it or not. It's not that way now. 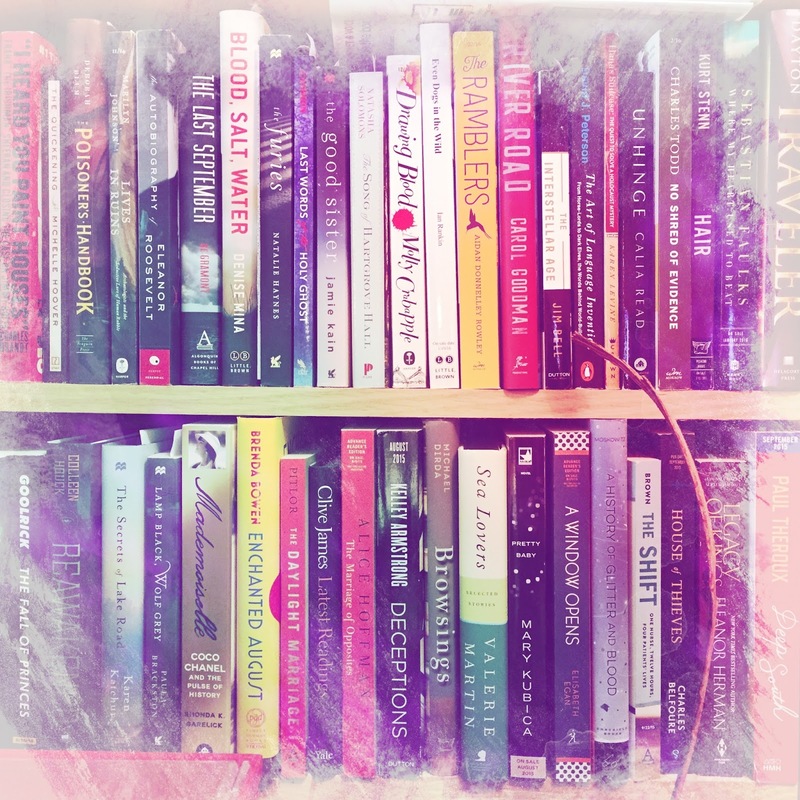 I have trouble getting rid of books but I need to because mine are double stacked on the shelves and I tend to forget about the ones in the back. I still have trouble quitting a book for some odd reason. Loved this post! I wasn't sure about e-reading myself when I first tried it out but now I pretty much only read electronically, just because it allows me to read more and is more convenient than reading print books. Fantastic post! We have a lot of similarities in reading style. I like to have an audio, print, and ebook going at all times because I use them all differently and I like to kind of balance out my reading. If one of my books is a tough read emotionally or just on the dry side than I'll try and have at least one of the other books be lighter and fast paced. I'm the same with book acquisition too. It's sad to have a week with no new books but at the same time where I feel so overwhelmed because of just how many books I have waiting on me. I was nodding my head as I read until I got to the part about reading series out of order. Still can't do that one. 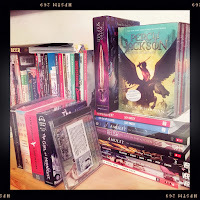 What a great post and one I think a lot of us bookworms can relate to! I like eBolks and borrow them from the library quite a bit. Also buy from Amazon to load to Stella, my beloved Kindle Paperwhite. Could never get into audio books unless we had a long drive. When my son was st FSU school (K-12. Not the university) we would listen to books on Cd because our drive was long. That was fun. New books arriving are always great! So many trilogies! And series... And I agree with pretty much all of this! Yep! I love this post! I can relate to all of these. I absolutely consider it culling to get rid of books that you've finished! I keep very few books, only the classics and a few I think I might reread some day. When there's time. But, yep, it's always so fun to get new books and only so much room in a house!